Tomorrow is the 16th. Which is my half birthday. haha. So in six months i'll be 25...scary stuff. 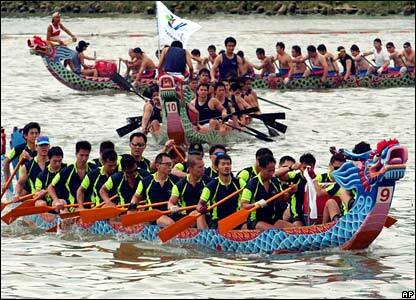 That and it is Dragon Boat Festival which means it's a public holiday. YAY! I get the day off work. 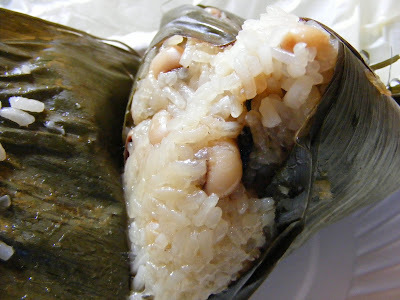 So the plan for tomorrow, if no rain, will be to go to Lukang 鹿港 (Lù gǎng). I will hop on a bus and meet folks there for a good wander. Also, I think Geoff has his hopes set on getting to the ocean. I hope that happens. It would be nice to see the sea. In China (and Taiwan), the Dragon Boat Festival memorializes the Chinese patriotic poet Chiu Yuan (340 BC-278 BC or 343-290 B.C. ), who committed suicide by jumping into a river after tying himself with big rock on the 5th day of the 5th lunar month. Chiu Yuan was the number one advisor of the kingdom of Chu. But people were jealous his position. The king wouldn't take his advice in the end and was killed by the enemy of neighbour kingdom. 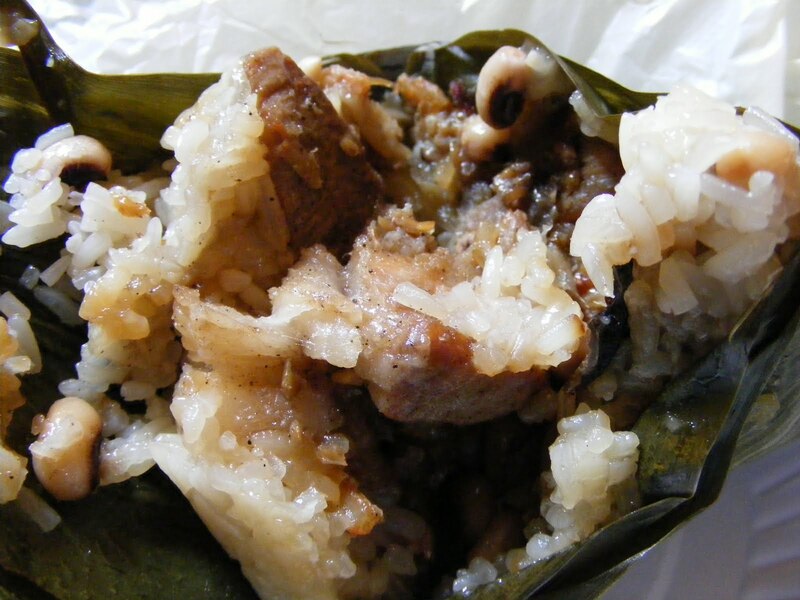 The new king continued to enjoy a luxurious life and didn't like Chiu Yuan. Later, Chiu Yuan was exiled. He wrote many patriotic poems after then. Chiu Yuan met a fisherman, who never cared about the country and was quite satisfied with his life. Chiu Yuan thought that the king wouldn't run the country, people only cared about themselves, nobody cared about the future of the country and so to live was meaningless. So he killed himself by drowning himself in the river. Many fishermen tried to rescue him, but the body was never found. Fishermen were worried that fish would eat his body. So they threw food into the river to feed the fish. Plus, they tried to scare fish away by splashing the water with their paddles and beating the drums on the long narrow boats. Then the dragon was added into the story. 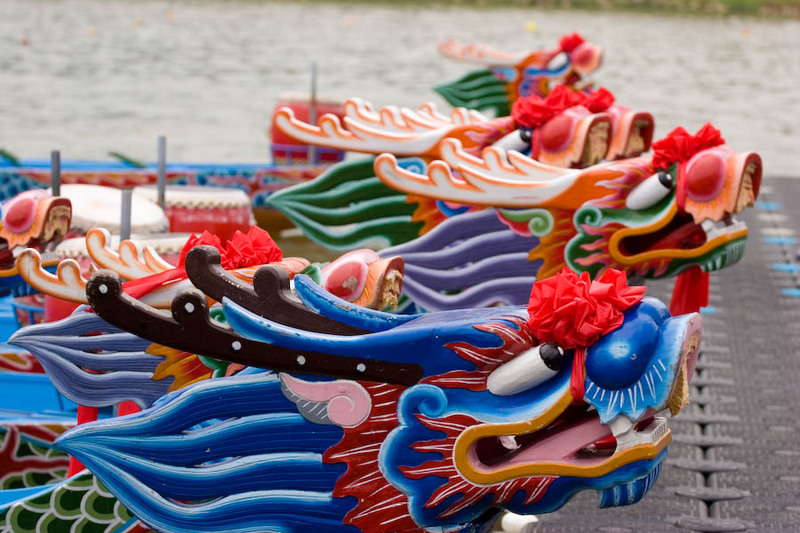 Fishermen believed there was a water-dragon under the river. One man poured down a big jar of strong yellow wine (made of rice). Later, a drunken dragon-like fish floated on the river. One piece of Chiu Yuan's clothing was found in-between the whisker of the water-dragon. 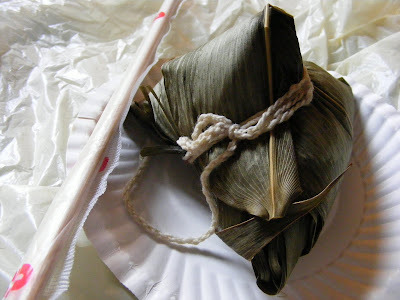 So to celebrate Dragon Boat Festival there are races and people eat Zhong Zi...Rice dumplings because they were thought to have been the food that was thrown into the river to feed the fish. This is a rice dumpling that my friend Melody gave to me. She made them at home...or her mum did. I'm not sure. She is a good workmate of mine.